Modern Machine Shop 79 Blockchain Using MFG Tokens Many of SyncFab's users have already made a literal buy-in. MFG Tokens were introduced in a token sale that ended in April. Transactions in this new cryptocurrency have not replaced traditional, U.S.-dollar payments for work (not yet, anyway). For now, at least, the online network continues to operate much as it always has. However, purchasers are using MFG Tokens to pay SyncFab's transaction fees. Perhaps more notably, the tokens will soon provide extra incentive for participants to interact. For machine shops, the promise is even easier access to work and even greater ability to do what they do best: make parts. This new incentive system will operate simi- larly to a hotel rewards program, and the MFG Tokens will be the "points." It will work like this: A purchaser can entice manufacturers by attaching MFG Tokens to an RFQ as a kind of bounty. Any shop that proposes a viable production process fast enough can claim a portion of this bounty, even if the purchaser does not accept the quote (the winner, of course, gets the work and part of the bounty). Shops can also post their own MFG Token bounties, essentially offering instant, guar- anteed discounts to purchasers that order (or re-order more quickly) from them. Buyers get access, and shops get paid for the significant work involved in quoting a job—work that is typically uncompensated, or perhaps even deemed unworthy of a shop's time and effort. Lower-quantity parts orders attract more atten- tion. More parts get made locally. The network becomes more responsive. 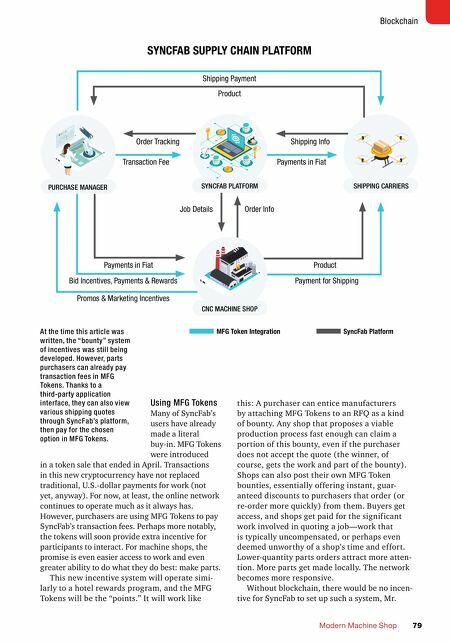 Without blockchain, there would be no incen- tive for SyncFab to set up such a system, Mr. CNC MACHINE SHOP PURCHASE MANAGER SHIPPING CARRIERS SYNCFAB PLATFORM MFG Token Integration SyncFab Platform Shipping Payment Product Order Tracking Transaction Fee Shipping Info Payments in Fiat Job Details Order Info Product Payment for Shipping Bid Incentives, Payments & Rewards Promos & Marketing Incentives Payments in Fiat SYNCFAB SUPPLY CHAIN PLATFORM At the time this article was written, the "bounty" system of incentives was still being developed. However, parts purchasers can already pay transaction fees in MFG Tokens. Thanks to a third-party application interface, they can also view various shipping quotes through SyncFab's platform, then pay for the chosen option in MFG Tokens.